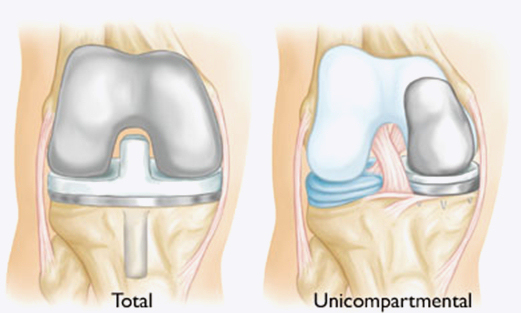 Unicompartmental knee arthroplasty involves one are; the medial, lateral or patella area of the knee. The primary goal of a UKA is to reduce pain and restore function. The prosthetic device in a UKA does not affect the existing ligaments, tendons or nerves. Most UKA prosthetic devices last for 10 -15 years. Seek advice and treatment from a Physical therapist pre and post op if you are in need of a UKA. Osteoarthritis is a major condition, impacting almost everyone at some point in life. The pain associated with osteoarthritis of the knee can make walking and other activities difficult. Patients suffering from this condition often turn to knee replacement surgery as a way to restore quality of life. In recent years, doctors have made significant advances at replacing just one part of the compartment in a procedure known as unicompartmental knee arthroplasty. With proper Physical Therapy, this simpler surgery is often less painful can reduce recovery time. As active people age, they may experience some form of arthritic condition. The changes to the cartilage can begin many years prior to the onset of the debilitating arthritis symptoms. While any joint that moves can develop arthritis, weight-bearing joints such as the knee or injured joints are more likely to be diagnosed with arthritis. Injuries, excessive weight-bearing activities, being obese or the natural anatomy of the knee joint can be the precursor to the onset of the symptoms. Arthritis is painful, limiting motion and strength as well as reducing the function of the involved joint. The combination of the symptoms of arthritis can have a very negative impact on the patient’s quality of life. Initially the treatment for an arthritic condition that involves the entire joint is the same. The patient will be asked to take anti-inflammatory drugs, attend Physical Therapy, and modify lifestyle. Visiting a Physical therapist is easy and does not require you to see a doctor first. The current environment enables a Physical therapist to evaluate and treat a patient without a doctor’s prescription. The patient’s insurance might require a referral but the laws do not require a doctor’s prescription. The conservative approach is usually successful for a period of time, but eventually the patient will most likely require joint replacement surgery. Some patients suffering from osteoarthritis of the knee can opt for Unicompartmental Knee Arthroplasty as an ideal alternative to total knee replacement. The knee joint is made up of the femur, tibia and patella. These three bones form a joint that has three different compartments, medial femoroltibial, lateral femoroltibial, and patellofemoral compartment. Each of these compartments has the ends of the bones covered with an articular cartilage surface known as Hyaline cartilage. If an arthritic change occurs, the Hyaline cartilage is damaged and the underlying bone is exposed. If the damage occurs to one of these compartments and not the others, it is now possible to replace the damaged compartment and not surgically touch the other two areas. This procedure is called a Unicompartmental Knee Arthroplasty or UKA. The UKA procedure is gaining popularity because it is less invasive with a smaller incision to reduce the risk of surgical complications, reduced rehabilitation time following the procedure due to less pain and a faster return of motion. Physical Therapy is a critical aspect of the rehabilitation process because most patients will not have the ability to regain their motion on their own. Shortly after the procedure is performed (usually 3-7 days post op), the patient will begin a formal Physical Therapy program. The program will begin with the primary goals of reducing pain and swelling while initiating the process of re-establishing the normal motion and muscle action of the involved lower extremity. The rehabilitation will progress over a period of several months which allows the prosthetic device to heal or become securely attached to the bone and the muscle structure of the core, hips and entire lower extremity to develop enough strength to be able to dynamically support and move the body. The restoration of function is the primary goal of any Physical Therapy program. The first phase of rehabilitation is to gain motion and reduce swelling and pain. This usually takes several weeks. The second phase, beginning around 8 weeks post op focuses on developing strength, proprioception (neuromuscular control), and muscular endurance. This phase transitions to the final phase that focuses on restoration of all functional activities. No time period is set in stone but in most cases the entire process takes up to 1 year to restore full function. Unicompartmental knee arthroplasty surgeries are gaining popularity for a number of reasons. In most cases, the rehabilitation process takes a shorter period of time, is less painful and the patient gains their functional ability more quickly.